Happy Conference Championship Day, everyone! As sad as this may sound, it's also true -- there are just two days left before September to enter a daily fantasy football lineup, so let's fire one up and have some fun. We'll help you out as best as we can with your lineup. Happy Conference Championship Day, everyone! As sad as this may sound, it's also true -- there are just two days left before September to enter [a daily fantasy football lineup](https://www.betchicago.com/fantasy-football-start-em-sit-em-michel-playoffs), so let's fire one up and have some fun. We'll help you out as best we can with your lineup. I've done these lineups [periodically throughout the regular season](https://www.betchicago.com/nfl-week-17-draftkings-lineup), but this is my first foray into the playoffs. Here are my results so far: Week 2, 160; Week 3, 166.2; Week 4, 130.5; Week 5, 133.5; Week 6, 143.6; Week 7, 114; Week 8, 147.5; Week 9, 114.64; Week 10, 139.4; Week 15, 97.42; Week 17, 90.34. My Week 17 score was my worst so far, but that's mostly because Aaron Rodgers was my quarterback, and he left the Packers' 31-0 home loss to the Lions after the first quarter after suffering a concussion. He finished only 3-of-5 passing for 26 yards. We [may not get the offensive fireworks](https://www.betchicago.com/nfl-betting-report-sharps-moneyline-saints-chiefs-rams-patriots) this weekend that these four teams provided in the regular season, so we'll have to be extra precise in choosing our lineup for later today. Let's see if I can get some of that early season magic back. 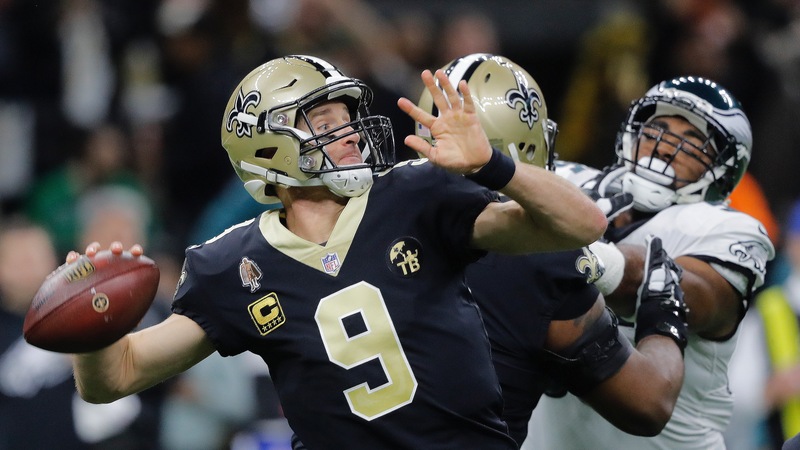 __MORE NFL coverage:__ [NFC Championship Game preview](https://www.betchicago.com/rams-saints-betting-lines-records-ats-pick-total-rematch-nfc-title-preview) | [AFC Championship Game preview](https://www.betchicago.com/patriots-chiefs-betting-lines-pick-trends-sharps-preview-afc-championship) | [Staff picks](https://www.betchicago.com/nfl-picks-against-spread-conference-championships-patriots-chiefs-rams-saints) __Also see:__ AFC Championship Game [prop bets](https://www.betchicago.com/best-prop-bets-patriots-chiefs-afc-championship-game-jan-20)/[weather report](https://www.betchicago.com/afc-championship-weather-report-wind-chiefs-patriots); NFC Championship [prop bets](https://www.betchicago.com/best-prop-bets-rams-saints-nfc-championship-game-jan-20); [betting report](https://www.betchicago.com/nfl-betting-report-sharps-moneyline-saints-chiefs-rams-patriots) ## NFL Conference Championship DraftKings lineup *[DraftKings](https://www.draftkings.com/lineup) gives you a budget of $50,000; also, you guys and gals [know the matchups by now](http://www.espn.com/nfl/scoreboard) -- Rams at Saints followed by Patriots at Chiefs -- so I won't put each team's opponent after their name like I did during the regular season. __QB: Drew Brees, Saints ($6,900)__ -- Just think he's the safest play this week. Tom Brady and Patrick Mahomes might light it up in the other game, because the weather in Kansas City [won't be quite as bad](https://www.betchicago.com/afc-championship-weather-report-wind-chiefs-patriots) as was first expected. But Brees in the Superdome has averaged 26.8 fantasy points per game this season, and he had 22 last week despite the Saints only scoring 20 points. Take Jared Goff at your own peril, as he's got six touchdown passes and six interceptions his last six games and the Rams' gameplan will likely be to try and ground-and-pound with Todd Gurley and C.J. Anderson. __RB1: Sony Michel, Patriots ($5,600)__ -- This pick is a bit more matchup based, as the Chiefs [allowed 5.0 yards per carry](http://www.espn.com/nfl/statistics/team/_/stat/rushing/sort/yardsPerRushAttempt/position/defense/seasontype/2) in the regular season, second worst in the league only to the Rams (more on that in a second). Again, a cold Kansas City after dark may lead Bill Belichick to call for plenty of rushing plays, which means Michel, who had a monster game last week against the Chargers (24 carries, 129 yards and three touchdowns), will be your guy. May seem like an obvious choice, but it's the right one. Don't overthink things. __RB2: Mark Ingram, Steelers ($4,600)__ -- I wouldn't fault anyone for wanting Alvin Kamara instead, but today is the day Sean Payton is going to unleash the bruising back to wear down the soft Rams run defense (5.1 yards per carry allowed in the regular season). Yes, Aaron Donald is a beast in the middle, but Ndamukong Suh can be run on and the Rams linebackers might be the worst unit on the team. Ingram has been used sparingly in the second half of the season, but that's actually a positive because he's fresh. Expect in the neighborhood of 75 or 80 yards and a touchdown. __WR1: Julian Edelman, Patriots ($6,600)__ -- Brady may not always throw passes, but when he does, he throws them to Edelman. [Stay thirsty, my friends](https://www.youtube.com/watch?v=oP0DaZBmwQI). But, no joke, Brady loves Edelman, especially in the postseason. Do you realize Edelman has the second most receptions in the playoffs? Yup, only [the immortal Jerry Rice has more](https://www.pro-football-reference.com/leaders/rec_career_playoffs.htm). You're crazy if you don't play Edelman, who had nine catches (on 13 targets) for 151 yards last week against the Chargers. __WR2: Robert Woods ($5,700)__ -- As you can probably tell already, I'm not high on the Rams in this game, especially Goff. But if L.A. is down two scores in the second half, they're going to have to open up the offense more, and that should at least mean more targets for Woods, who had six catches (on eight targets) for 69 yards last week against the Cowboys. __WR3: Sammy Watkins, Chiefs ($4,000)__ -- Gotta do a little bit bargain hunting at some point, so why not here? Watkins actually had a solid return from a foot injury that kept him out six of the last seven games, as he had six catches (on eight targets) for 62 yards, including a 34-yard catch-and-run. Pretty similar numbers to Woods last week and at a cheaper cost. __TE: Travis Kelce, Chiefs ($7,100)__ -- Going a little cheaper with two of my wideouts allows my to splurge on Kelce, who seven catches (on 10 targets) for 108 yards last week against the Colts. He's also the safest tight end play this week, with at least 10 fantasy points in all but one game this season. Gronk is cheaper, but Kelce is the play here. Also, just a quick note if you're going bargain hunting at TE, Benjamin Watson of the Saints isn't expected to play due to appendicitis. __FLEX: Tyreek Hill ($7,700)__ -- I'll give you a little insight to how I pick my teams: I fill every slot before the flex and then just scoop up the most expensive player I can afford. Shoot, I could do a lot worse than Hill as a consolation prize. He'd technically be my No. 1 receiver (based on price), but I still like Edelman better. Still, hard to argue with a guy who had eight catches (on 13 targets) for 72 yards, and did this on an end around... <a href="https://www.youtube.com/watch?v=WD98nH24UHE" class="embedly-card" data-card-width="100%" data-card-controls="0">Embedded content: https://www.youtube.com/watch?v=WD98nH24UHE</a> __D/ST: Saints ($2,100)__ -- The Rams have the lowest floor for any of the four offenses playing today, and it's mostly due to Goff. Gurley and Anderson shredded what had been a sound run defense in the Cowboys last week, but with the decibel level cranked up in the Superdome, it'll be tougher sledding for them against a defense that allowed only 3.6 yards per carry in the regular season, second best to the Texans. For more on whom to start or sit in fantasy today, click [here](https://www.betchicago.com/fantasy-football-start-em-sit-em-michel-playoffs). __PLAY:__ Our free [NFL Conference Championship Pick 6](https://betchicago.chalkline.com/games/sunday-nfl-challenge). Just correctly answer six prop questions for Sunday's games to win a BetChicago prize pack.